Ok, it's been a while since I started thinking of buying a different ETF. At the moment I have a good spread of the Satrix Indi and eRafi Indi. 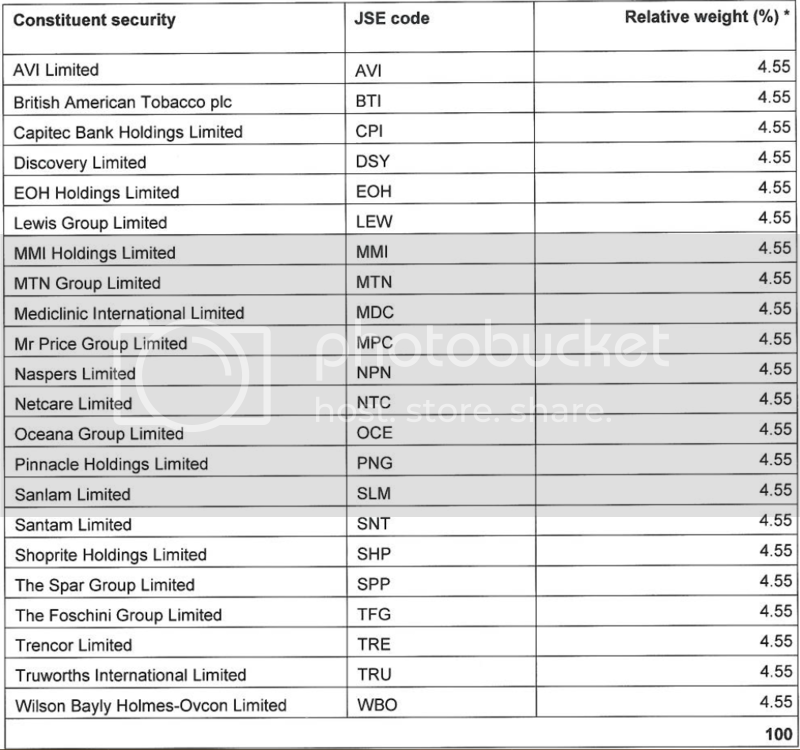 Both of those are heavily weighted in one share, the STX in Naspers and the eRafi in MTN. Then on another note, I'm kind of in the home stretch to quitting my job, with somewhere between 1 and 5 years to go (obviously depends on many things), and that makes me think a little about dividends. While I know that selling shares is favourable income tax wise if you're a low earner, I do quite like seeing money magically appear in my account as it does with dividends. 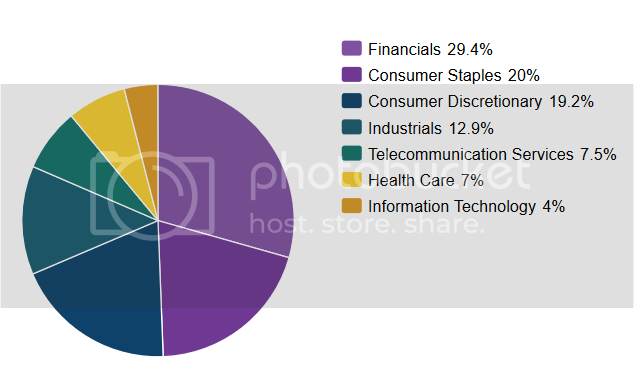 So since I'm not clever enough to pick a share, I thought I'd look around and see what ETFs there are that pay reasonable dividends, and hopefully also provide some growth. Ideally they would also not have > 15% in a single share like STXIND and RAFIND do. So I looked at the Satrix Divi, but it's performance has been pretty terrible over the last while. Growth (including dividends) over 1 year of 5.6%, over 2 years was 8% and over 5 years 12.6%. Not somewhere I want to put any money. The performance has been great. 29% in 1 year, 23.7% in 3 years and 22.3% in 5 years, including the yield of about 3%. It's not often I do a comparison chart and see an ETF hovering about the Indi. Any other opinions on this ETF? I'm seriously looking at ETF's now and that one looks right up my ally. How do I go about buying as I can't find it on the JSE? Found it I think. 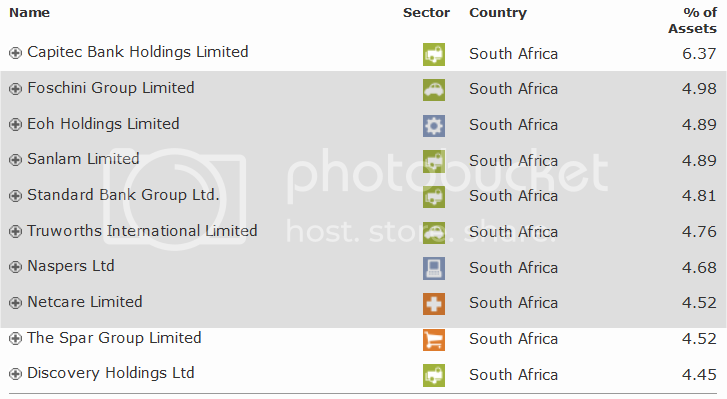 Moneyweb has it as GDT but it is DIVTRX on the JSE. Is this the correct one as it has only been listed for about 1 year? Yeah it's DIVTRX. The ETF is new, about a year old, but the index has been around for over 5 years I believe. Thanks P. Sold all my CML today and now looking for opportunities to buy this one. Might take a few days to get filled. How on earth to buy this. Only 2 sellers and at a tenth of the volume that I want. When I bought for my TSA - I wanted 10K and I could only buy 5K. Although I guess you looking for a few more Mr Cash Flush Orca. I would also look at the Satrx/ Rafi FINI as well - and of course the SATRIX/Rafi INDI. 1/3 each would probably get you a pretty decent portfolio. I guess this one flies out the window then. The Satrix Divi and Rafi were a dead loss this year and not much better over 5 years. The performance and resilience of the Indi seems attractive to me. It's an ETF, there should always be robot buyers and sellers taking everything you want. I'll check it in the morning when the market opens again. I was also under that impression but on Twitter there are people complaining about the large spreads and severe lack of volume. One person saying that if Grindrod cannot do it then they should outsource it. The spreads are much larger than the general market performance of the day. This is poor management and I have lost confidence in it as it only has a market cap of R34m and should they delist, you will have to wait months for your money. The "robots" will buy and sell 5000 of these shares at a time, continuously. That means you can do a purchase for +- R142 000 at a time. Once you've done that transaction, give the system a few minutes and you'll see that the robots have replenished themselves back to 5000 again. The current spread is 20c, meaning you're likely paying a 10c premium over the asset calculated price. That's a percentage of 0.35%. That's more than the STXIND at 0.12%, but less than the RMBMID at 0.61%. One point to note, is that the DIVTRX has a TER of 0.38% against the STXIND of 0.45%, so you will make back that spread fee in about three years, and after that you'll be better off. Unless something major changes my mind, I'm still planning on switching my purchasing to DIVTRX from next month. Their Market Maker will top up with 5 000 shares at a time and if you require more then you can do so via your Market Maker or contact Grindrod. On Friday I was watching STXIND and DIVTRX and found that the robot of the INDI kept topping up the buys and sells well within range to track the index and a mere 0.3%. The DIVTRX had a 5% buy spread when the ALSI and the STXINDI only had a 0.3% change. Then the topping up stopped and only 1 seller at a small volume of 500 and this lasted most of the afternoon. I think their robot needs fixing.